In an age where video games seem to be growing bleaker and darker in tone and subject matter, sometimes it’s nice to play something a little more light-hearted. Through that lens, Spyro Reignited Trilogy is a welcome tonic of purple silliness. But the game’s PEGI 7 rating belies its true target: millennial nostalgia. Released on Monday by Activision to mark the 20th anniversary of the original Spyro on the first PlayStation, Spyro the Dragon, Spyro 2: Ripto’s Rage! 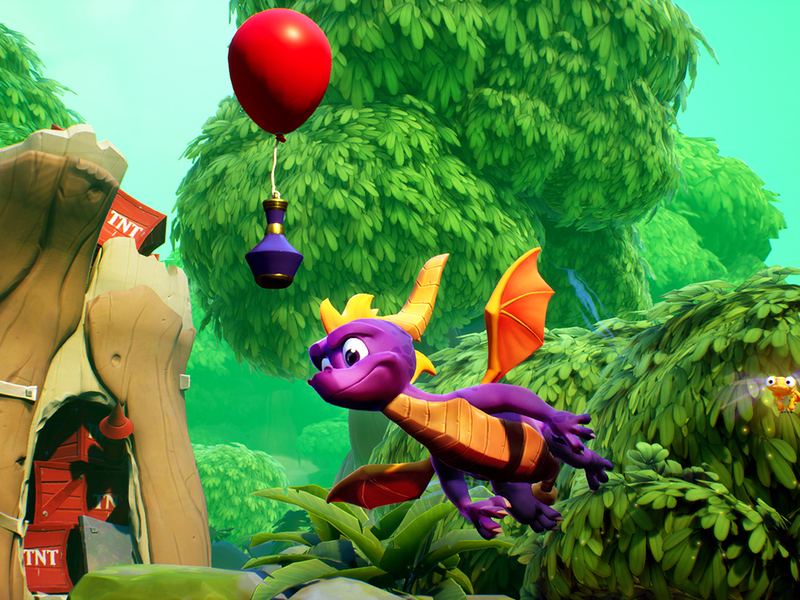 and Spyro: Year of the Dragon have been rewashed and spruced up in crisp HD by developer Toys for Bob. The controls and cameras are sharper, and the original games’ music and voice acting has been re-recorded. A before (left) and after (right) shot. In the first game of the third-person (or dragon) platformer trilogy, you start out in Artisan World, the first of five realms infested with gnorcs (an amalgamation of gnome and orc, as the name suggests). Spyro’s attacks are a dashing headbutt and a wall of flame. Enemies aren’t particularly difficult to deal with, but they do regenerate if you leave and return to a level. The camera’s always centred on your little dragon, so it’s important to keep shifting it when stepping into new areas. Spyro’s health is represented by the colour of Sparx, his little dragonfly companion. You can pick up health by roasting the small animals and critters scattered around the levels. Rescuing your fellow dragons, who have been encased in stone by the evil Gnasty Gnorc, saves your progress. The dragons all fit the context of the world in which you rescue them — easel-wielding painters in the first; battle-scarred warriors in Peace Keepers’ World; Merlin-bearded magicians in Magic Crafters; and so on. Ripto’s Rage! and Year of the Dragon follow a similar structure, but throw in more fun with supershots, skateboarding and even a boxing ring level. Perhaps the most challenging aspect of Spyro comes in the flight levels. Here, you need to guide the fully airborne dragon through rings, to perilously placed treasure chests and between spiky portals. You start out with just 20 seconds to do this and the only way to make time is by touching, burning or flying through these objects. Boss fights, on the other hand, felt quite easy — this could be down to the improved controls, which always feel fluid. Double-tapping X lets you glide and it’s always fun to spring Spyro upon a pack of gnorcs from above, fire raining down upon them like a (cute) nightmare of the Apocalypse. Twenty years ago, Stewart Copeland, who played drums for The Police, composed a soundtrack for each Spyro level. His score has been remastered — although you have the option to revert to the original music — with a new track thrown into the mix to celebrate the trilogy. 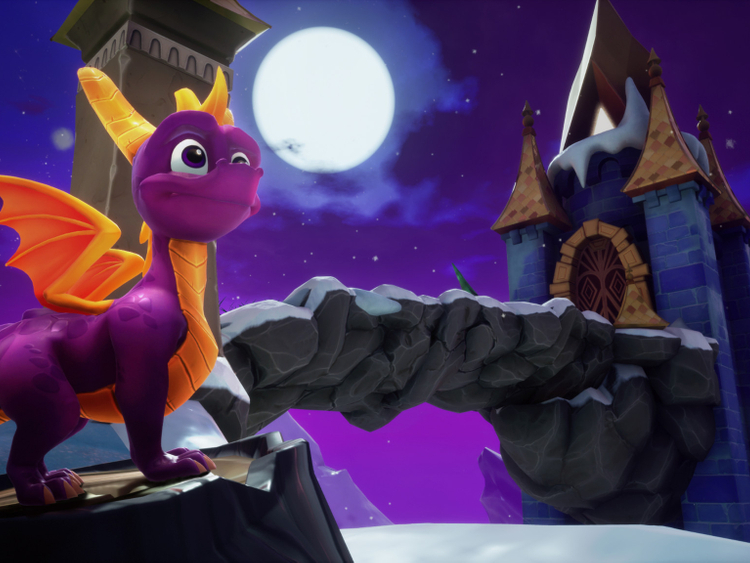 “With Spyro Reignited Trilogy, Activision is letting nostalgic fans relive their youth while also introducing Spyro to a new generation of gamers,” says Michelle Fonseca, Senior Product and Marketing Director at Activision, the game’s publisher, adding that “2018 is all about embracing the 1990s”.